Thousands of students appearing in the Secondary Education Examination, nationally referred to as SEE, were at their wits’ end on Sunday when they found the question papers for Compulsory English littered with errors. Mistakes were found in question papers prepared for Province 3, Province 5 and Karnali Province as well as in those for examinees retaking the test. The mistakes ranged from spelling errors to incomplete sentences, deciphering some of which solely depended on the examinees’ pure guesswork. But many students simply did not answer because they did not understand the question. “I could not figure out what the question was. I did not answer,” Rosana Paudel, a student of Bagmati Boarding Secondary School, told the Post. But teachers told the Post that they never received any instruction to that effect. “We did not receive any message from the Board. Without any instruction from the Board, we are not allowed to make any changes in the question papers. There was no question about instructing students,” said Indra Gurung, principal of Prolific Higher Secondary School at Dhumbarahi, Kathmandu. Prolific Higher Secondary School was the exam centre for students of Bagmati Boarding Secondary School. Education experts say the problem is not a couple of errors in question paper; the issue is even bigger--that there is an utter lack of seriousness on the part of authorities when it comes to the country’s school sector. 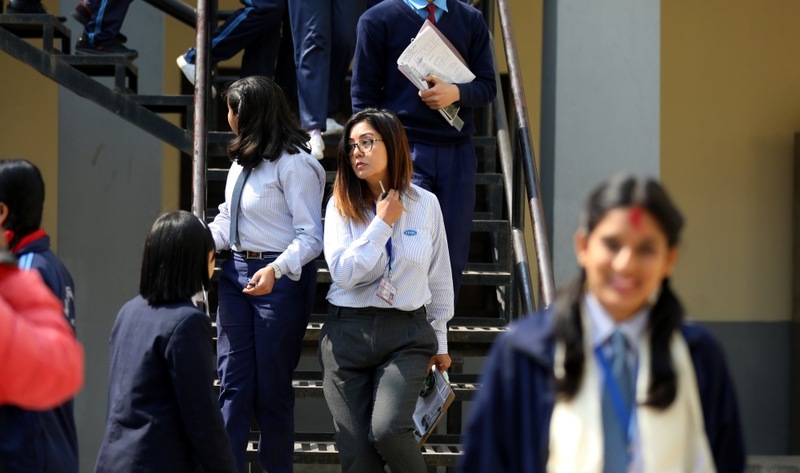 “The concerned authorities are not serious at all about improving the school education sector,” Bidhyanath Koirala, an educationist, told the Post. The way the question papers--that too for English subject--appeared in front of students shows how haphazardly and carelessly they are made, experts said. The same question which asked students to “read and do the tasks” has different spellings for the same word. In one instance, it has “Rachanawali” whereas in the last paragraph the word has been spelt “Rachanwali”. It is obvious from the passage that it is talking about Lekhnath Paudyal, a national poet who is known widely known by his honorific ‘Kavi Shiromani’. But the passage spells the poet’s last name as “Paudel”. Question (c) of 4(C) spells “compiled” as “complied”. Questions (a) and (b) of 4(C) have different spellings for the poet’s name--Lekhanath and Lekhnath, with the first one having an extra “a”. In Province 5, one of the questions on “direct and indirect” speech also threw students into a tizzy, as they were asked to change direct speeches into direct speeches. 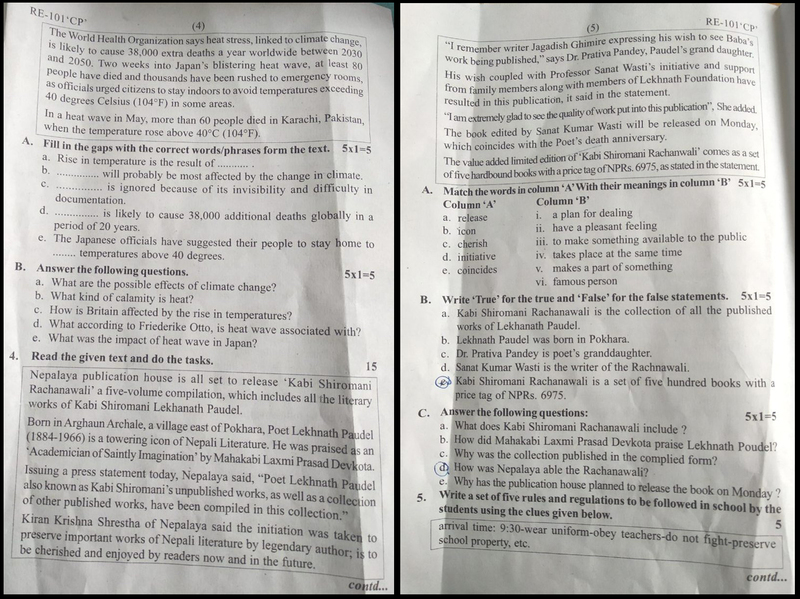 Question papers of Province 6 and those for students appearing the exam were also full of spelling errors. The Board, which had the questions reviewed by a team of experts just as the exam papers were distributed to students, conceded that there were mistakes in the questions. However, this is not the first time errors have been found in question papers prepared by the Board. According to officials, the question papers remain sealed until the exam starts at different centres to maintain secrecy. Board members and a team of experts invited by it get to see the question papers only after the exam starts, according to officials. “But the problem starts when the question papers are prepared. They are prepared without paying due attention. Concerned officials could have easily rechecked, if there were any errors, before question papers were distributed to students,” said Koirala. Some have demanded that the students should get marks for the questions they did not answer because they were incomprehensible. Laxman Shrestha, a secondary school teacher at Saraswati Secondary School in Bhaktapur, who was invited as one of the experts by the Board to review the question papers, said the Board should change the model answer sheet based on which the examiners check the students’ answer papers. “Why should students suffer because of mistakes committed by the Board?” Shrestha asked. “Those who have not answered the questions because they were incomprehensible should get the marks,” he told the Post. But the Board chairman ruled that possibility out.